A young star cluster surrounded by three concentric bubbles was recently found near the M33 galaxy, revealing a cosmic splendor that could be compared to Russian matryoshka nesting dolls. The concentric bubbles, which comprise what researchers call a triple-bubble, are actually three supernova remnants, shells of gas and dust that form following the explosion of a star. This is the first known case of three supernova remnants nesting one inside the other, said the researchers from the Institute of Astrophysics of the Canary Islands (IAC), who made the discovery. The above illustration shows what a cross section of the three rings might look like if scientists could get a closer look. 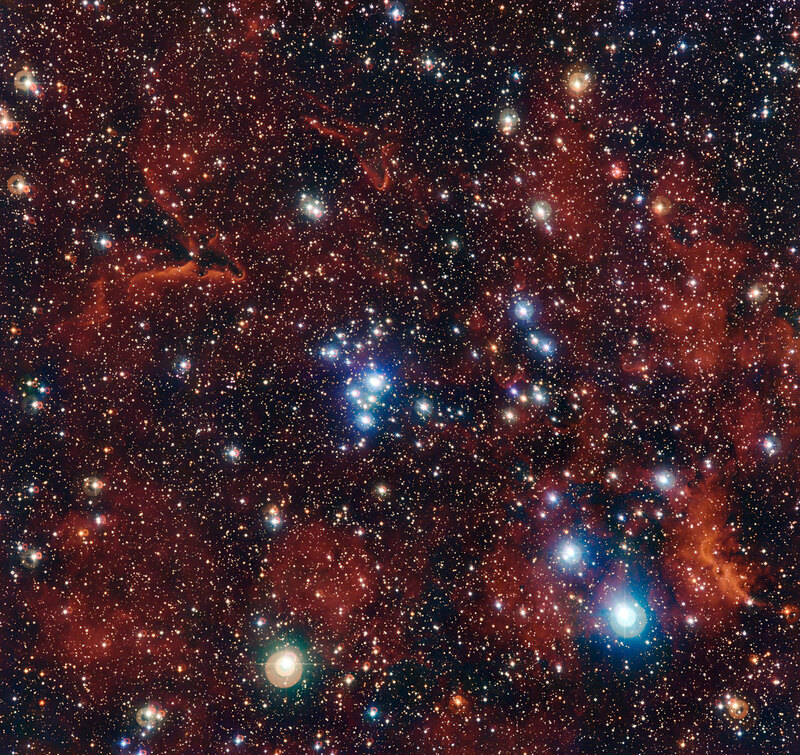 The shells provide a unique opportunity to study the remains of these stellar explosions, as well as the interstellar medium, which is the gas and dust that lies between stars, John Beckman, co-author of the new study, said in a news release. Beckman is an astrophysicist with the Spanish National Resource Council and IAC. "We can measure how much matter there is in a shell, approximately a couple of hundred times the mass of the sun in each of the shells," he said. Astronomers recently mapped each of three concentric bubbles surrounding a star cluster in the galaxy M33, revealing that as the bubbles grow in size around the young star cluster, the speed of expansion decreases. Using the high-resolution 2D spectrograph GHaFaS (Galaxy Halpha Fabry-Perot System), mounted on the William Herschel Telescope in Spain's Canary Islands, the researchers examined the complex structure of this triple-bubble. The work revealed that the three shells all formed chronologically in the same way, from separate supernova explosions within the same star cluster, Beckman said. 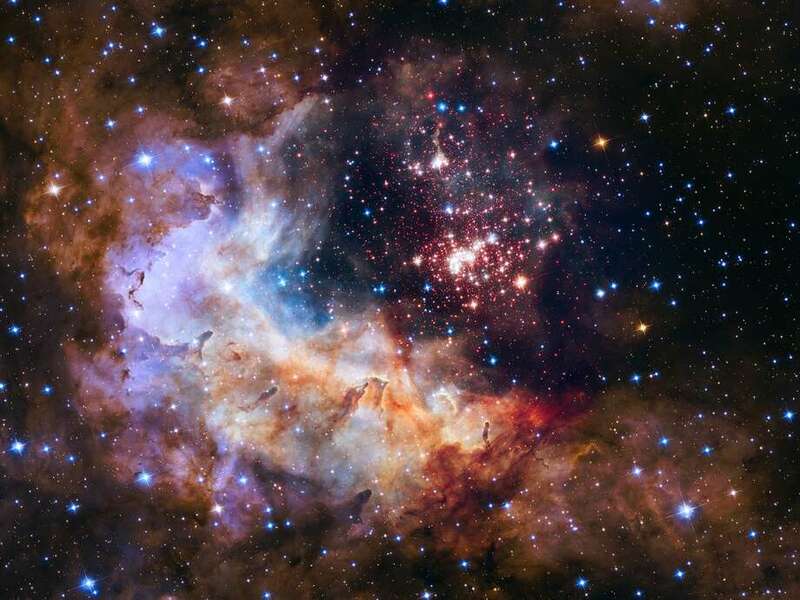 "The first [supernova] explosion drives out a lot of gas that gets compressed into a shell," Beckman told Space.com. "But the [interstellar] medium is not uniform — it is made of denser clumps of cooler gas that were present before the supernova explosion. When the supernova goes off and its gases start to expand, it picks up more gas from these clumps, which piles up into this expanding shell. "This first shell carries on outward, expanding and slowing down gradually," he added. "Then, the second [supernova explosion] goes off and does exactly the same thing: It produces a shell by sweeping away some more of the [leftover] gas from these clumps, and the clumps gradually get smaller but are never fully destroyed. And then the third one goes off in the same way." Each of the shells starts off fairly fast and gradually slows down. The first shell of the three is the slowest and the biggest, while the third is quicker and much smaller. The second shell falls somewhere in between, in terms of speed and mass, Beckman said. "We can roughly calculate when the supernova explosions went off," Beckman added. "We know how fast the shells are going and how big they are, so we can work out the shells' ages." For example, researchers estimated that the first shell is the result of a supernova explosion that occurred 20,000 years ago, the second shell from a supernova explosion 10,000 years ago and the third shell from a supernova explosion 5,000 years ago. However, this time line is only a rough estimate, as more work is needed, Beckman said. The team found this triple-bubble while observing a spiral galaxy known as M33, or the Triangulum Galaxy. With an estimated mass of between 10 billion and 40 billion times that of the sun, M33 is the third largest member of the Local Group — the galaxies that are near the Milky Way. The discovery was part of a program called BUBBLY, which the team of researchers established to find huge, expanding bubbles of gas lingering in interstellar space, IAC officials said in the statement. These cosmic objects, also known as superbubbles, are created by powerful stellar winds and supernova explosions of individual stars, and can vary greatly in size and structure. This new triple-bubble provides researchers with a cosmic lab in which they can study star formation and supernova explosions, the researchers said in the release.